Over the past couple of weeks, I’ve shared my most important insights into how to succeed with the Habits of Mind. 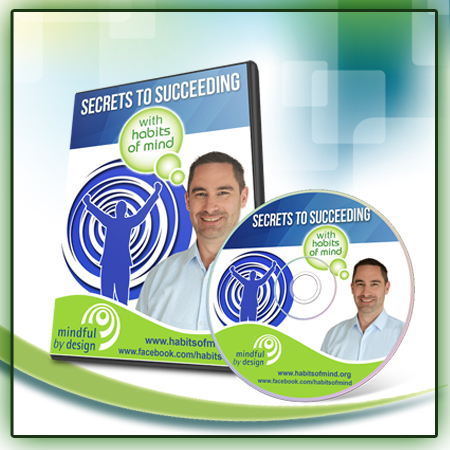 This week, I want to get to the heart of what the Habits of Mind are all about: Learning to Behave more Intelligently. When Art Costa first described what would become known as the Habits of Mind, he used the term “intelligent behaviours”. Costa had identified these behaviours based on other researchers’ descriptions of what the most intelligent people do. These were people at the top of their field, who worked on the most difficult problems and achieved the highest standards. Costa described these people as engaging in the Habits of Mind. But as useful and powerful as this picture was, it was incomplete. These people weren’t simply “demonstrating” Habits of Mind. They demonstrated how to use them in their most skillful, mature and highly developed form. Think of it this way. Not all problems are equal. Some problems are difficult – much more difficult – than others. Solving easy problems requires only a basic, simple application of the Habits of Mind. You don’t have to behave too intelligently to solve easy problems. But as problems become more difficult, they demand an increasingly well developed set of behaviours. This means you must learn how to behave more intelligently. You must develop more mature Habits of Mind. It’s not that the people who have reached the highest level of performance “use” the Habits of Mind and other people don’t. It’s that these people have learnt how to use them more effectively and skilfully than other people. This means they can solve the most difficult problems and progress further than anyone else. They have learnt how to behave more intelligently. In this light, it became clear that our role in schools was not to teach the Habits of Mind, but to help students continually develop them. Unfortunately, many schools went down the path of “teaching” students the Habits of Mind – simply educating them about the names and meanings – and asking them to “use” them. They failed to realise that this was simply the introduction and more work was needed. The real work didn’t begin until we started to question how we could teach children to get better at the Habits of Mind. At the time, we didn’t have models that showed us what it looked like to get better at the Habits of Mind. To address this, I teamed with Costa and Kallick, in 2006 we published the Dimensions of Growth for the Habits of Mind. These dimensions represent the ways in which learners can grow within each Habit of Mind. While they don’t represent a complete description of development, they do describe the pathways along which growth can take place. Meaning: We seek out a deeper, more insightful, more sophisticated understanding of the Habit. Capacity: We build an increasing repertoire of skills, strategies and techniques through which we engage in the Habit. Alertness: We become more finely attuned to the signals and cues in a situation that tell us when we should and shouldn’t engage in one or more of the Habits of Mind. Value: We come to better recognise the benefits and advantages of engaging in the Habits of Mind. We place increasingly high value on them and choose to engage in them over less productive behaviours. Commitment: We become more committed to the ongoing development of the Habits of Mind. We learn to be increasingly self-assessing, self-directed and self-monitoring in our development of the Habits. In my observations, only the schools that embrace the idea of development, either by adopting the Dimensions of Growth or by working on development more intuitively, succeed in the long run with the Habits of Mind. When you focus on developing more intelligent behaviours in your students, your work with the Habits of Mind never ceases. Each year, your goal is to further develop every student’s intelligence so they are better able to solve increasingly difficult challenges. You have a goal that truly sustains your work; a goal that will ensure your focus on the Habits of Mind results in greater success for your school and, most importantly, your students. I hope these three lessons will help you and your school achieve real, sustained success with the Habits of Mind. If you would like to discuss them further, please email me at james@jamesanderson.com.au.